It's becoming clear that Samsung Galaxy X is not going to win the folding phone crown without a fight. Huawei has a bendy rival lined up, and then there's Motorola's reboot of the Moto Razr, which is a rather different type of folding phone. Now Intel is taking an interest, and has mooted a a triple-screen fold-out monster which unfurls from a standard, if slightly odd looking smartphone, into a mighty tablet. And it's got a stylus, everyone! Come on, is this what the next Galaxy Note 10 should really be like or what? The patent for the Intel foldable phone was spotted by the ever reliable LetsGoDigital which also mocked up the concept images. 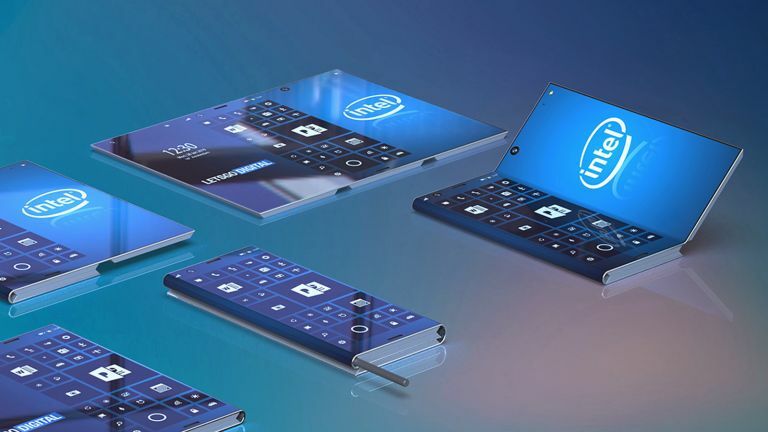 While a folding phone of any kind is cool at this stage, the Intel model could be particularly excellent thanks to a dual hinge folding system. Rather than simply folding out into a screen from phone mode, this handset will fold out twice allowing for a massive final display that gives a true tablet style screen which can fold down into a pocket-friendly smartphone form. As if that wasn't good enough the patent also describe a stylus which slides into the handset. So you should be able to use the handset in tablet mode to annotate, design, draw and anything else you can do on a tablet with a stylus, only now you can do it from your pocket. The device is described as running Windows. It should feature sensors and cameras that are hidden under the screen. The result should be a totally bezel-free screen. Each section has two cameras meaning six snappers in total. It should be possible to use this in phone mode, dual screen mode or full-size triple screen mode. The idea is to make this a proper mobile workstation, that lives in your pocket or bag. Expect to hear more at Mobile World Congress 2019 in February when lots of manufacturers will announce their first foldable phones.